The GA2000-2A uses the new Carbon Core Guard structure and is smaller, thinner, and lighter than a GA-100. The GA2000-2A comes with a dual-color resin band which is easily removable and Casio America is planning to make other bands (including Velcro, Cordura, and cloth ones) available separately. Key features include shock resistance, 200-meter water resistance, world time, 1/100 second stopwatch, countdown timer (24 hours), 5 daily alarms, and dual Super Illuminator LED light. 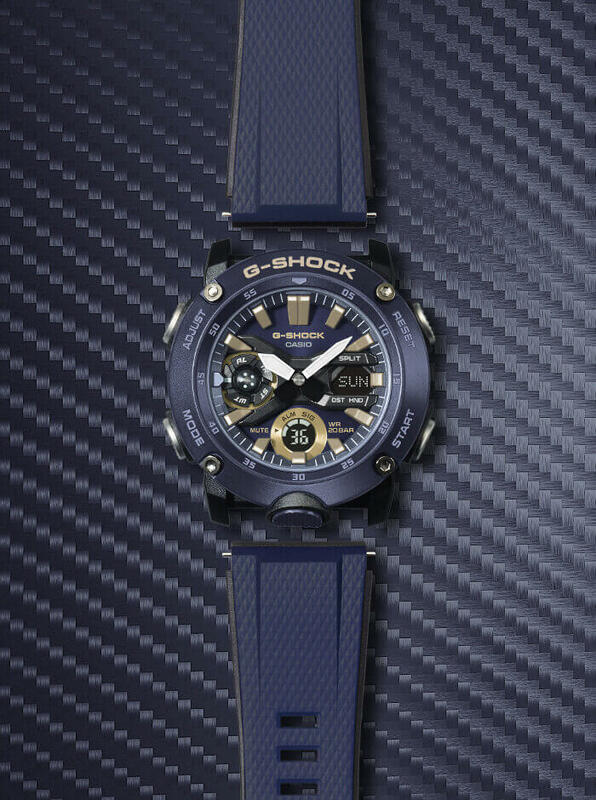 The GA2000-2A will be released in May 2019 with a list price of $130 USD. The other band options will be released in July. Update: North America is also getting the first three GA-2000 launch models as well as the olive green GA2000-3A and brown GA2000-5A which is part of a military color series along with the GA2000-2A.